Acute Batch Image Processor Lite is a tool that can convert between image formats, resize, flip and so on. Convert from jpeg, gif, png, psd, tiff, bmp, pcd. 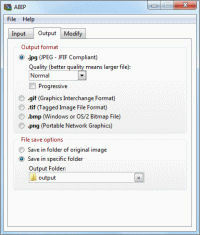 Convert to jpeg, gif, png, tiff, bmp. Select compression level, quality and other output options. Recompress image files to make them smaller. Resize, flip and rotate photos and images. Just drop files or folders onto the ABIP window to convert. Automatically searches for selected image file types. Portable - no setup or install to run.